This podcast episode format is a first for me and quite a departure from our usual format. 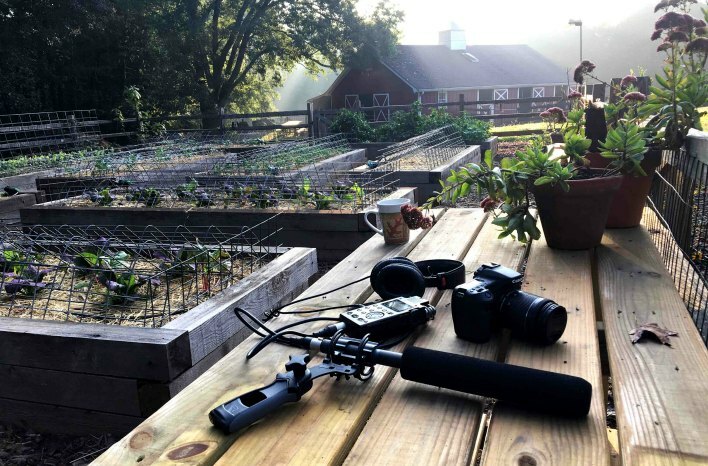 In this episode, I take the mic and recorder outside for a behind-the-scenes day in the life at the GardenFarm™. I’m calling it an “audio journal” – snippets of a typical weekend Saturday for me. From the time I first head outside early in the morning, to that time of peace and reflection late at night under the stars. Along the way, I share with you some of the sounds (and sights through the pictures below) of what it’s like out here on the first day of fall, 2017. And along the way, I throw in some teachable moments as they come up. I hope you enjoy this episode as much as I enjoyed making it for you. Believe it or not, this rooster (Louie) is not at the top of the pecking order of our flock, although he sure does act like it. He is the most vocal though. You hear him a lot throughout this podcast episode. Our head rooster duties go to the smallest but most senior rooster of the flock, Reggie. He is small but very mighty indeed, at least in stature. Reggie is the last remaining survivor from our original flock brought down here when we moved from North Carolina over five years ago. We love Reggie, and he loves his hens. I can’t believe how protective he is. Whenever the big guy (above) gets a little frisky with Reggie’s girls, Reggie bows out that chest and pulls back those wings like a super-hero. 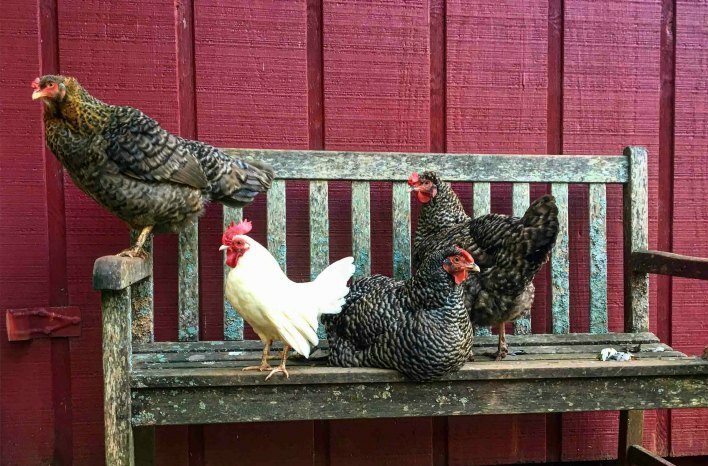 While clearly dwarfed by all the other chickens, especially the other three roosters, no one messes with Reggie. You hear Reggie on this podcast too. He’s the one randomly making his presence known all throughout this episode. Whenever you hear a rooster that sounds like he’s got laryngitis, that’s Reggie! Reggie is one proud and confident rooster. I don’t think he know’s he’s as small as he is. 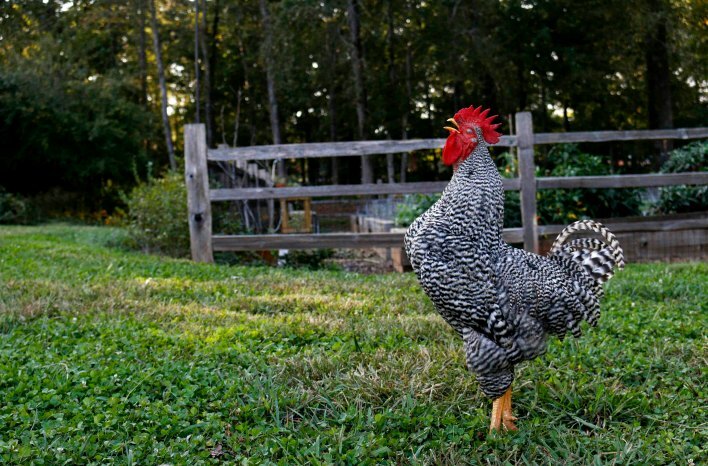 But he rules the roost and holds the top position in the pecking order, even above 3 other much larger roosters. My fall garden was planted just ahead of hurricane Irma’s shift in the path straight towards Atlanta. Having just planted new tender seedlings and not really knowing what I could do to protect them, I thought that anything would be better than nothing. So, I pulled back out many of the tomato cages I had just put into storage two-weeks prior, and laid them horizontally across the beds. Although I knew I couldn’t do anything to protect all these new plants from the wind, I hoped the cages would help block falling debris from all the trees that line the north border of the garden. It worked beautifully. Miraculously, I was fortunate the winds that arrived the next day as a tropical storm did little to harm my tiny, tender seedlings. Now a new threat was looming. The intense rays of the sun combined with unseasonably warm temperatures were taking a toll on some of the more tender young plants. Thankfully the cages were still in place and a perfect support structure for laying shade cloth to knock off some of the sun’s impact, buying each plant in those beds a little more time to settle in under less duress. That worked too. 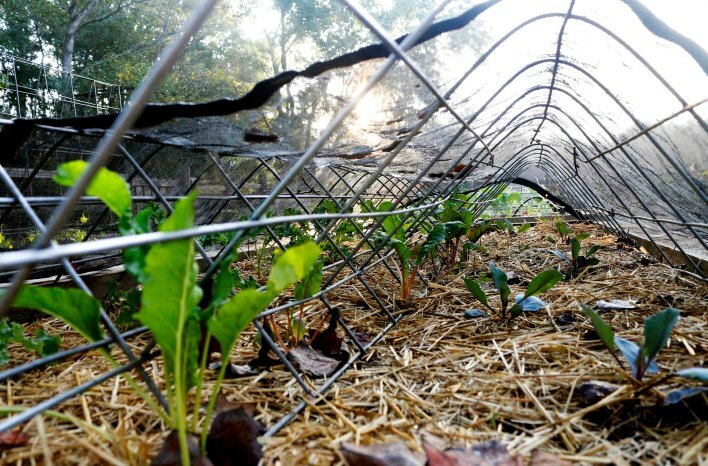 The tomato cages turned hurricane shields also provided the perfect support structure for laying shade cloth over tender seedlings as they eased into their full sun environment. A weekly chore I never tire of doing is managing my compost. I have a 4-bin system made from free, untreated shipping pallets. Over many years of composting, this is still my favorite way to make compost. 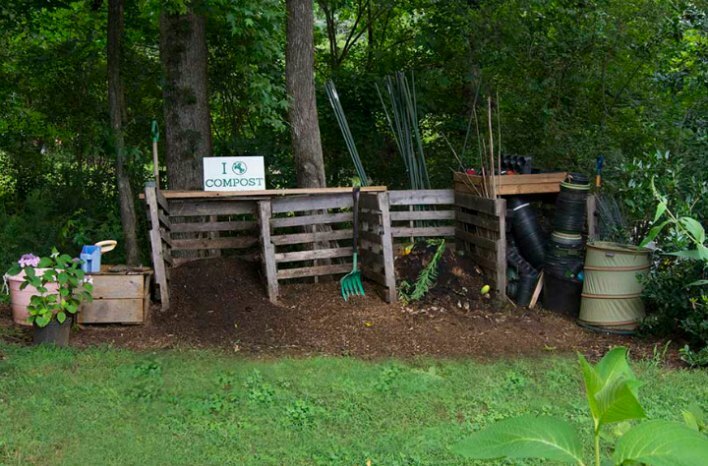 Considering the low cost, accessibility to quality pallets, and simplicity of making this bin; it doesn’t get much easier or cheaper to make a lot of compost at home. While this bin has four bays, I only need and use three for the different stages of compost: new, in-process and finished. A must-have in my opinion for anyone looking to improve their compost-making skills, or simply to monitor the state of their compost as it goes from new to finished, is a compost thermometer. Not to be confused with a soil thermometer (with only a 6-inch probe), a compost thermometer has a 20-inch probe (or longer) to reach deep into the core of the compost heap. That is exactly what you need to accurately access the internal temperature where it matters. You can find them online for less than $20. A compost thermometer is a small investment to get great feedback on the state of your active composting efforts. 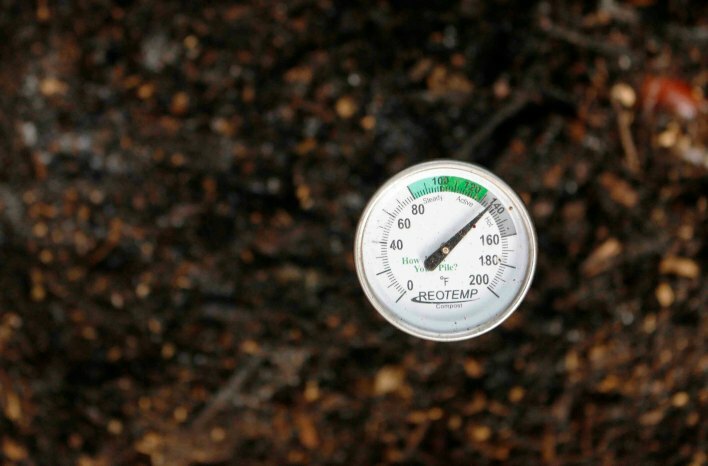 If your pile is at or above 130 degrees, you’re well on your way to quick compost. A favorite activity I love to start or finish my day with is a leisurely stroll around the property. Although I do admit, it’s rarely without lots of stops for pest inspections or photos, mental notes about garden chores and more. But I most enjoy the wonderful surprises that greet me every time. 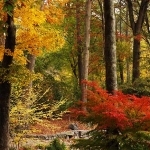 Having a four-season garden of native plants ensures there is always something of interest to see. This time of year, two of my favorite fall plants are starting to show their beauty and value to wildlife. Both of the following pictures were taken during the garden walk while recording this podcast. Beautyberry (Callicarpa americana) is easily identifiable in fall by it’s near florescent purple fruit clusters against the stems. It’s a beautiful contrast to the large golden leaves that eventually shed from the plant in fall. 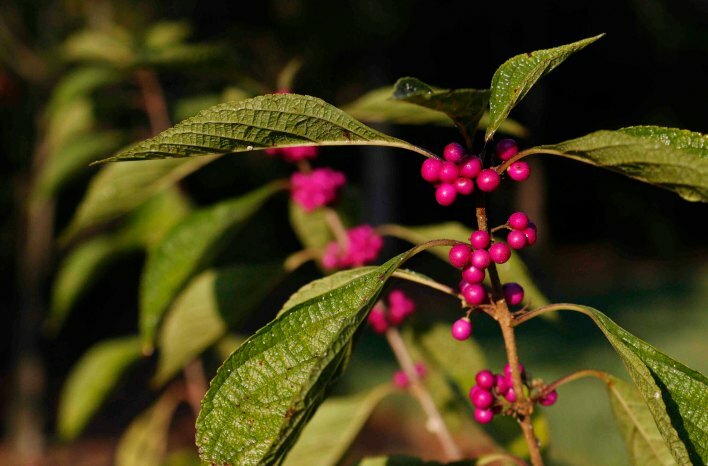 Beautyberry is a show-stopper in fall. While not much to look at the rest of the year, the unique display each autumn is a treat for gardeners and a welcomed food source for many birds. Perhaps my favorite plant for winter is Winterberry holly (Ilex verticillata) with its bright red berries that really pop in the landscape – until the birds get them. Birds love them as a food source. 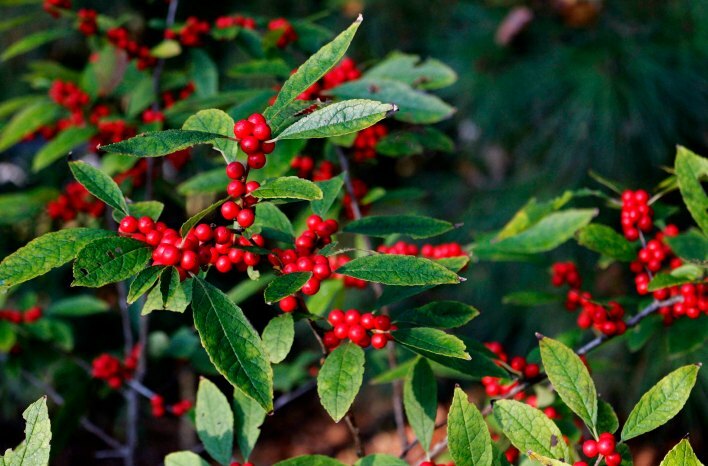 My favorite plant for winter interest is Winterberry holly (Ilex verticillata). Nothing else comes close to catch my eye with its bright red berries against an evergreen backdrop. Unfortunately, I rarely complete a full walk around the garden without noticing something I need to address. This time it’s another reminder I need to invest in a deer fence. After several years of living with constant setbacks from destructive browsing, it’s time to bite the bullet and install that deer fence. These oakleaf hydrangea leaves and next year’s bud sets have been stripped from most of my many such plants on the property. Mea culpa. Although I do spray with a deer repellent, I’m not around often enough to keep up with consistently applying it to be effective. 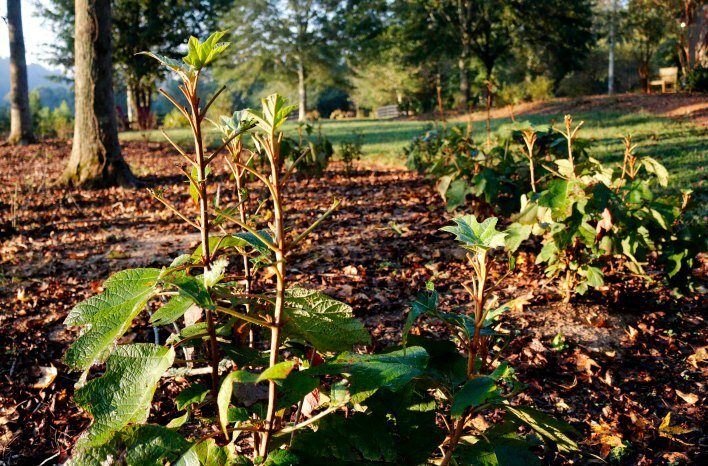 It’s heartbreaking to see most of my favorite shrubs (oakleaf hydrangea), stripped of their leaves by deer browsing the constant buffet on my property. Even worse, since next year’s flowers are already set on old wood, I won’t have those to enjoy either.